A 15-hour season finale party session never fails to disappoint underground music addicts. As one of the bastions of underground dance music culture on Ibiza, Circoloco, of course, brought in some of the finest underground talent for its final dance of the 2018 season. Needless to say, we were there from the start. Holding legendary status, the underground cult-favourite party went all out for the final bash of its 20-year anniversary season. Boasting some of the best-curated line-ups, it attracted masses to the underground haunt right through to its final week. The massive 16:00 to 7:00 party welcomed huge names to DC10 last Monday. Seth Troxler, The Martinez Brothers, Jamie Jones, Ben Klock, Damian Lazarus, Loco Dice, Ellen Allien, Marcel Dettmann, Tale Of Us, Nina Kraviz, DJ Tennis, Peggy Gou, Joseph Capriati, Apollonia, Rødhåd , Tania Vulcano, Matthias Tanzmann, Davide Squillace, Adriatique and more were all there, filling the three dance floors to the brim. Varied atmospheres and vibes reigned throughout its three dance floors. The Garden was a mecca for sunset-soaking and dusk music seeking partygoers, while the Terrace and the Main Room were packed to the rafters with underground music addicts. All areas offered some of the most memorable experiences an Ibiza raver can have. Cutting shapes in such close quarters shows that the diverse mix of clubbers has one thing in common: loving the music to its very core and dancing until it stops. Unlike many places, a noticeable lack of phones in the air distinguishes the party, a refreshing change to the current club land status quo. We are not surprised that it is consistently so packed. The aural sampling at a Circoloco party is of the highest quality. Here is a selection of tunes that kept feet moving until dawn and set souls alight on the final fiesta of 2018. Known as the first lady of Circoloco and queen of DC10, Tania Vulcano has been playing for both since '99. As the afternoon sun started to enter the golden hour, she warmed up the still fresh faces in the Garden. With its special drive and groove, Bloom gave an upbeat swing to early-party proceedings. Over in the Terrace, as the sun had set, Swiss lads Adriatique were providing some serious beats to a quickly filling dance floor. Tunes like Belong by youANDme provided soft washes of melodic beats. However, their final track, Tokyo Black Star - Blade Dancer (Dixon Edit), raised the bar even higher. Spotlight recently also caught up with Adriatique, check out the video here. Following Adriatique were French trio Apollonia. Dan Ghenacia, Dyed Soundorom and Shonky all frequent the White Isle on a regular basis and are famed for their funky skills behind the decks. Bringing the pace up a little with a mixture of beats full of underground flavour. But personally, Shape Fascination (DJ Deep Remix) really got the floor moving - a cool Parisian record selection made up of simply brilliant samples. There were too many fantastic bangers to pick from when it came to DJ Tennis's set. The Italian mix master transitioned from house cuts to daft punk to techno slammers - including the highly awaited currently unreleased Atlas by ARTBAT - with ease. The Founder of Life and Death certainly did not disappoint from his set in the Garden, charging the party with electricity as night fell. Nawasaki thudded through the speakers met with rapturous cheers and whistles. After DJ Tennis had finished his sick set, Loco Dice took to the Garden. The outdoor area was alive now and really filling up to full. As the evening crowd moved to chunky beats laid down by Loco Dice, wobbly jams like $lammer (DJ T-1000 Remix) added funky tones, but it was Hustlin' For House that was the real fist pumper overall. Things were spicing up in the Terrace with Joseph Capriati in full force behind the decks. The Italian don - winner of this year's Techno Master DJ award - controlled the excitable crowd perfectly as he dropped in massive tech beats. The anticipation for each tune was at fever pitch levels. Invasato by Zamoras was just one of the many incredible tracks played, Venezuelan rolling groove echoing around the dance floor. The Main Room is typically where the music hits its heaviest levels at Circoloco. This was no exception when Marcel Dettmann was on the decks. An export of Germany's underground scene and a previous resident of Berghain, Dettmann never disappoints with his tune selection. The heavy acidic beats of Dance Of The Warrior by Newa rumbled across the dancefloor. You could feel that bass in your chest. Holding down the Terrace as midnight approached were melodic techno chiefs Tale Of Us. They well and truly had the room jumping as they unleashed the sound of the Afterlife label on the eager ears of the DC10 clubbers. The track that completely sent the room bonkers was a recent release from Kevin De Vries. The weighty kick drums and spirited synth lines of Aratak left the Terrace brimming with pure dance-floor energy, every hand in the air. 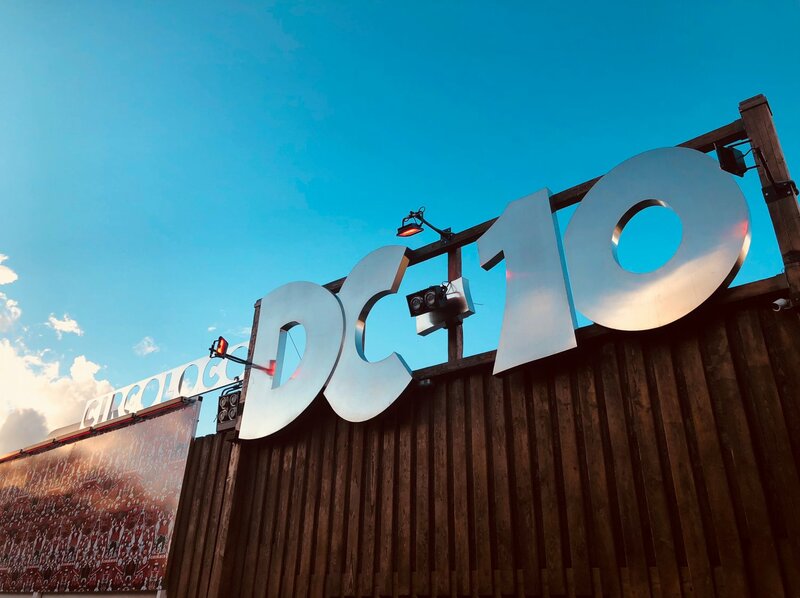 As the Garden reached its peak-time hours, Jamie Jones and Seth Troxler were getting the masses pumped up with a fine mixture of house selects. The two DJ legends showed great synergy in their b2b set, adding even more excitement to the open-air dance floor. This noughties deep house jam Let's Be Young brought on a refreshing change up to a more joyous and uplifting vibe that had everybody grooving. After a barrage of banging beats for the entire evening, a more mellow morning tune was certainly welcome to our ears as the end of our DC10 raving session drew near. Damian Lazarus is a true storyteller, blending sound waves to create a musical journey like no other. This was certainly true for his set at Circoloco, as he dropped the minimalistic synth trance house sounds of In Your Eyes - a truly blissful moment in the Main Room as morning broke. And so Circoloco is done and dusted for another summer, having thrown another unforgettable series of parties for its 20th anniversary season on Ibiza.